Contrary to my previous post, tonight for dinner I went to a not so high-end restaurant, Dok Bua located on Harvard Ave in Coolidge Corner. When I'm not scarfing down eel & avocado rolls, my stomach craves Thai food - another cuisine of weakness for me. 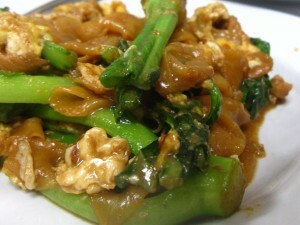 In particular, I can't get enough of a particular dish called pad see ew. Have eaten it at hundreds of times over the past 4 years or so and still will not order anything else but this when I go to a Thai restaurant. What can I say, when I like something, I really like it. So, I went to Dok Bua tonight which happens to ALWAYS be busy no matter which night of the week it is. I imagine it is because of quick service, cheap prices, and really good food. For $10.95, I got my pad see ew, tom yom soup, and 4 spring rolls. If you ask me, that is what I call a DEAL! Half for dinner tonight, the other half for work tomorrow - perfect. If you are looking for yummy, cheap, and fast Thai food, go to Dok Bua. It is truly one of those holes in the walls that serve off the chain food. (It's actually not that much of a hole in the wall) YUM!